If there is something we love in IREMA Slow Fashion is the energy and feelings that colours express. Life is full of colour, so our collection too. But what is the meaning of every colour? We analyze hereunder some of the most popular colours of our collection… Choose your favorites! ? This colour gives calm and peace. It reminds us of the sky and its immensity. It talks also about constancy. The ideal colour to wear if you are feeling nervous or you need to communicate something. It is perfect too for a hard day of work or even for cooking. 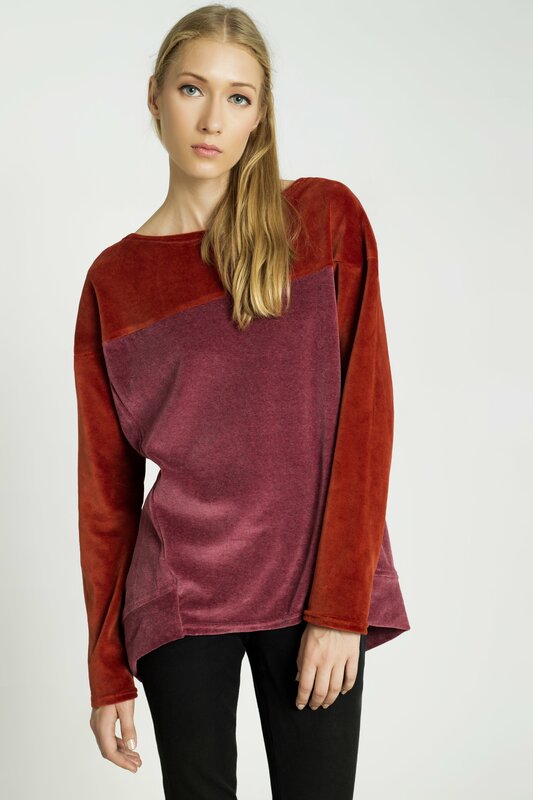 Velvet sweatshirt in old pink. Always related to women, this colour transmits sensitivity, femininity and friendship. But it contains a note of fun and joy. Wearing clothes in pink you will feel yourself and adventurous and you will want to travel. In this case, the “old” indicates love for the past and the roots. Zero-waste cotton dress in terracotta. This colour gives us the welcome, it inspires warmness and reminds us of the earth but also of the home. In addition, the terracotta is related to health and abundance. The perfect colour if you want to feel great. Japanese style dress in turquoise. A mix between green and blue, this colour reminds us of the sea, the ocean, a tropical beach… It is a relaxing tone, perfect to avoid stress, to wrap us in calmness and happiness. Besides, if you need inspiration, then, wear something in turquoise. Passion, intensity, impulse, strength… These are some of the characteristics of this colour, an intense kind of red that reminds of the blood and the wine. Maroon inspires the desire to live and feel. Ready to wear maroon garments and feel the passion? Many people relate this colour with sadness, boredom or coldness. Maybe it is not the most joyful tone, that is for sure, but the gray also talks about secret places, wisdom, experience, respect and humility. How do you feel wearing gray clothes? Up to here, our little analysis about some of the colours we love in IREMA Slow Fashion. Sometimes we don’t realize about the importance of colours in of our life and in our wardrobe, but, believe us, they can change your day ?. See you next week!